Lake Mead’s water levels are the lowest they have been in history and will continue to drop over the summer. The lake currently is at a level of 1074.7 feet, the lowest it has been since 1937 when it was still being filled. The water levels are expected to reach their lowest point of 1070.5 feet in June, according to the Bureau of Reclamation’s Lower Colorado Region. The bureau’s projections puts the lake slightly below the water shortage line, but water levels should increase by August to low, but not shortage levels. Rose Davis, spokesperson for the Bureau of Reclamation, said the chances of the lake experiencing a long-term water shortage this year are slim. 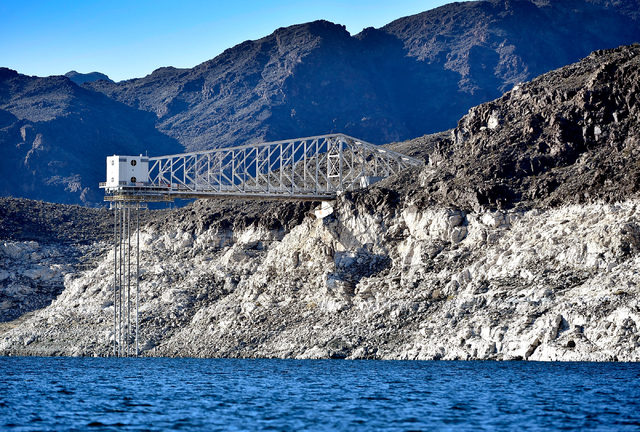 Lake Mead has experienced historic water decreases before. Last June the lake fell to its then-lowest point of 1075.08 feet. The Bureau of Reclamation projects a federal water shortage at Lake Mead and the Colorado River by January 2017. A shortage of water would not only affect the water supply of Nevada but also other states including Arizona and California, as well as Mexico, which is provided with 1.5 million acre feet of water a year from the Colorado River. Lower water levels also would result in a reduction of electrical power output from the dam’s hydro generators and drive utility costs up. Nevada is currently in the midst of a 16-year drought, which is caused by a lack of snowmelt from the upper Colorado River Basin. The Bureau of Reclamation is not the only federal organization worried about Lake Mead’s low water levels. The National Park Service is also on edge. “Whenever the lake drops it becomes a new beach,” said Park Service spokesperson Chelsea Kennedy. “New areas of sediment and new patches of mud can really be a danger to people in the park. We just want to make sure that people are a little more cautious when at the lake.” The National Park Service is urging parkgoers to look out for beach areas and rocks that were not there before.